A bit of horror for this blog post. 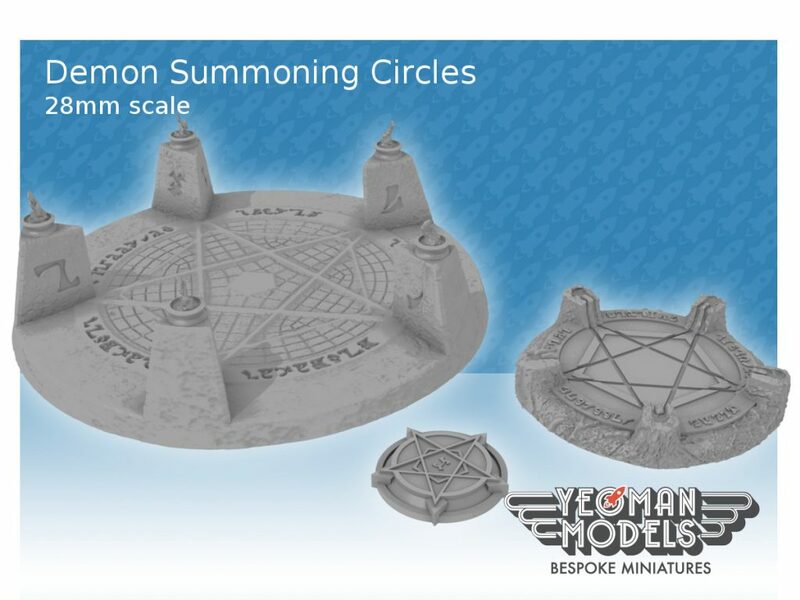 Jump on Shapeways or Ebay and summon up demons with this series of Demon Summoning Circles! The Large Circle have creepy writing around the pentagram (yes, it does translate as something, but I’m not telling you what it is) and also fire dishes on the top of each pillar. Great for summoning up a large demon and plenty of space for the dangling tentacles, claws, wings etc! It measures 15cm across and 4.5cm high. You can by it on ebay or Shapeways. The medium summoning circle also has creepy writing carved into the living rock with channels from each pillar forming a pentagram. The channels can run with glowing demon plasma, or lava, or blood! This one measures 7cm across and 1.5 cm high. You can by them on ebay or Shapeways. The small circle is a pentagram that can act as a base for a figure or a marker token. This little pentagram measures is 3cm across and 0.5cm high. These on ebay as a pack of three or on Shapeways as a single circle or three pack.